Gujarat Tourism has effectively used the television to promote its tourist attractions by roping in Amitabh Bachchan as the Brand Ambassador. But on the other hand, the state has also successfully used the digital space to reach online users, informing them about various aspects, culture, tradition and festivals celebrated. The branding is present on almost all platforms ranging from Facebook, Twitter, Youtube to Instagram and Pinterest. 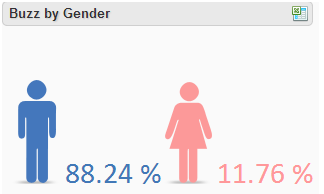 The Facebook page has a majority of male users at 88.24% and only 11.76% female population. Also, 76.56% of the users are above the age of 40 while only 18.75% between 31-40, 3.12% between 21-30 and 1.56% under 20 years of age. This suggests that the page should try and attract the youth by running youth specific campaigns etc. With over 100K fans on Facebook but only 821 people talking about the page, I believe the state tourism page has a huge scope for improvement. The cover image space can be used more aptly instead of using a photo of their brand ambassador. Also, the page can highlight features of the state through these cover images, which should be changed more frequently than they are currently. Apart from the cover images, applications too need to be refreshed as much as possible. The page is currently running a contest, which was probably started during the festive season of Navratri. After 2 months of the festive season, the application still exists. Apps have been used to integrate other platforms as well. The Content buckets on the other hand are very informative, diverse and full of flavors within the state. 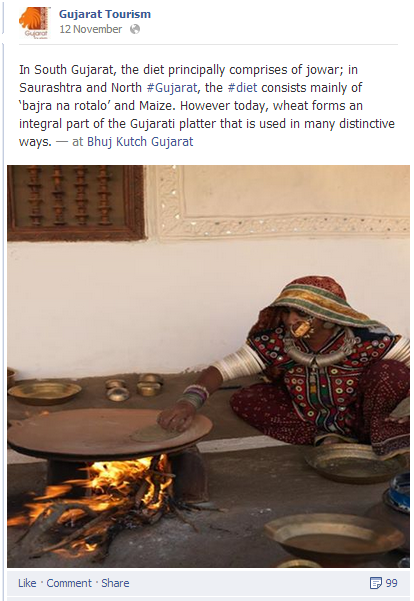 Post updates talk about the culture and various aspects of Gujarat. 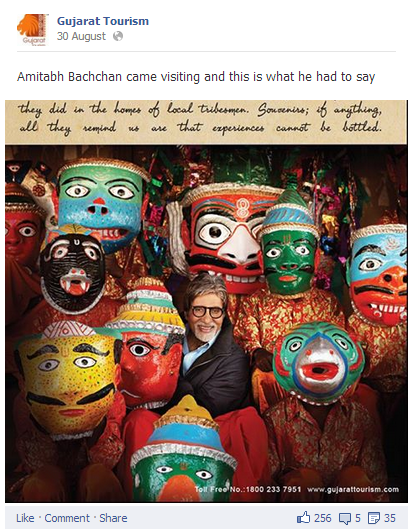 They also make good use of their brand ambassador, Amitabh Bachchan, through post updates. Though there is only one update in a day, the content strategy is consistent. Unfortunately, the consistency of these updates is not inviting good engagement results. I assume that feeding in regular and similar content to fans is saturating. The state should share more interesting updates that are interactive and try to strike a conversation with users. On an average, the page receives only 264 likes and 6 comments. Also, only 13.9% shares are received overall which is rather alarming. The content should be so interesting, that more and more fans would be willing to share your content, thereby increasing organic growth. 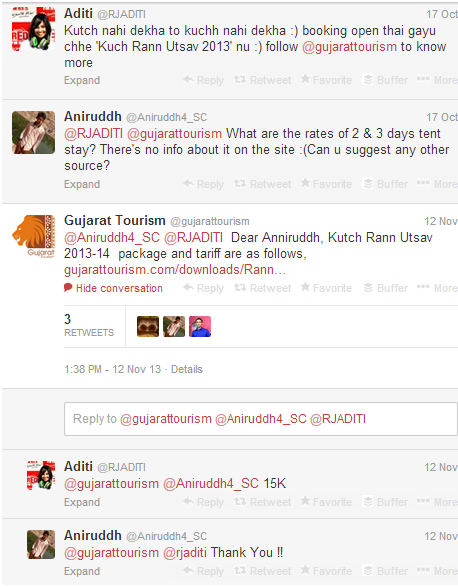 Gujarat Tourism has over 6K followerson Twitter. The content strategy on Twitter is also very similar to Facebook. #DidYouKnow, #Gujarat and #Navratri are among the few hash-tags that the state uses to market its content. It could definitely use more unique hash-tags created by the account to buzz about a particular topic. This would result in a faster growth rate. It could be a contest or an activity. Unlike Facebook, Gujarat Tourism is making an effort to converse with its followers. It replies to tweets with informative links. Since its Twitter content is as dry as Facebook, the engagement levels too drop from time to time. On certain days (count few in a month), the Twitter handle receives a good amount of mentions. However, on other days, the account is pretty much dead. Retweet levels too have hardly risen in the past three months. Unfortunately, there is nothing much to write about the state and its activities on Twitter apart from what I have already mentioned. 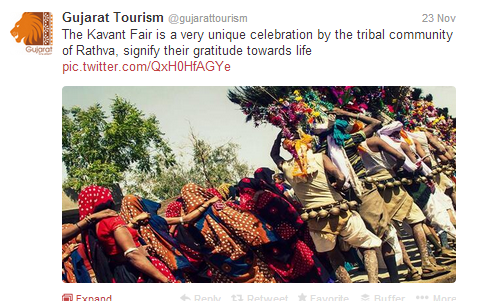 Gujarat Tourism needs to improve its consistency in tweeting. Between 27th November and 15th December, there is no tweet that has gone up. The state is young on platforms such as Youtube and Pinterest. With only 49 subscribers on Youtube and over 10K views, the channel has uploaded 22 videos. Though it has only been a year since the channel launched itself on the video sharing website, it has again missed the chance to be consistent. Most of these videos have been shown on television so I am looking forward to seeing innovative and interesting content on this platform as well. The Pinterest account has 9 boards and 39 pins with interesting snapshots of the wonders within the state. Most of the boards represent state festivals. It mostly looks like content repetition of Facebook and Twitter. Kerala Tourism is the closest competitor of Gujarat Tourism owing to the kind of work they are executing on Social Media. The state has 8 times the fans of Gujarat Tourism, with a total of 849K+ fans on Facebook and over 20K+ followers on Twitter. Kerala tourism has outshined Gujarat Tourism with much more engagement and exciting content on their accounts. While Kerala tourism enjoys 81.41% share in engagement, Gujarat tourism has only 18.59% attributed to it. 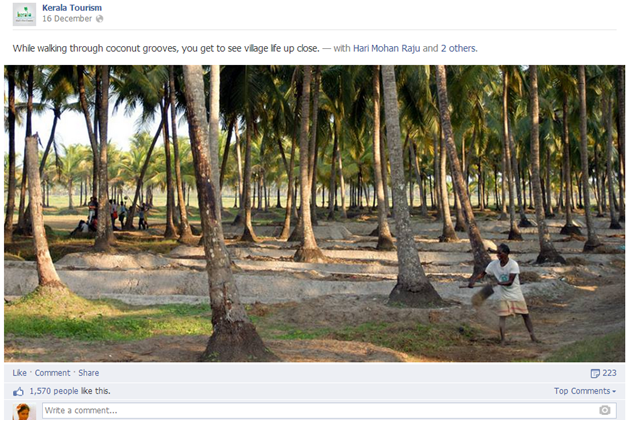 Even the likes, shares and comments per post are way higher than Gujarat Tourism. Kerela Tourism’s posts are definitely worth sharing. Their updates have crisp copy and very relatable images. As compared to Gujarat, this page has easy-to-glance through content. They run a lot of contests on Twitter too which sets them apart. Gujarat Tourism needs to wake up and revise its social media content strategy as a whole to stop being repetitive in nature. People are looking for fresh content and if the state decides to stick to its boring updates, it might begin loosing fans and followers. They should invest in chunk sized information and topical content. They could also have videos where they interview tourists and try to show various perceptions. Gujarat Tourism can have innovative contests too which can be executed on Twitter in an attempt to increase followers and awareness. 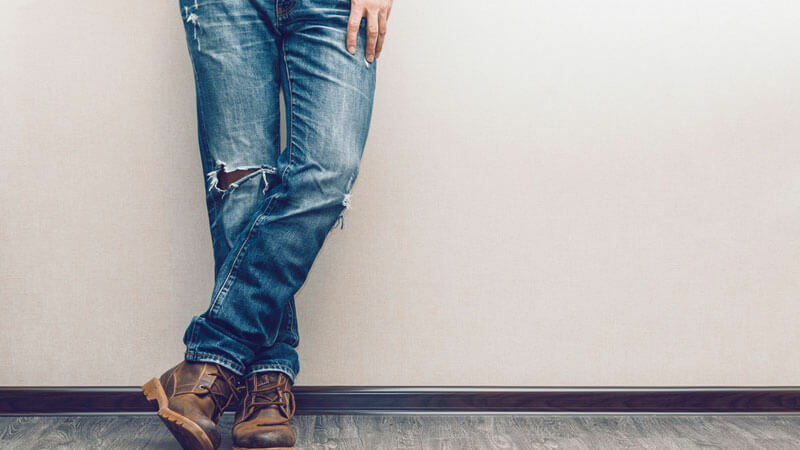 The saddest thing a brand can do with social media is use it like traditional media wherein one just broadcasts content without looking to either engage or get responses from its audience. Gujarat tourism does the same mistake and pays heavily in the form of a lack-lustre community. Honestly, Vibrant Gujarat could have been portrayed in a much more vibrant manner on social media but the fact that the page is reduced to a one way communication channel totally undermines the potential of the possible community. It’s about time Gujarat Tourism woke up and began engaging. Expert View by Rajiv Dingra, Founder & CEO of WATConsult – An Award Winning Digital & Social Media Agency.